Sea Ray is the world’s largest manufacturer of superior quality pleasure boats, producing more than 40 models ranging from 18 to 61 feet. The four families of Sea Ray products include Sport Boats, Sport Cruisers, Sport Yachts and Yachts. 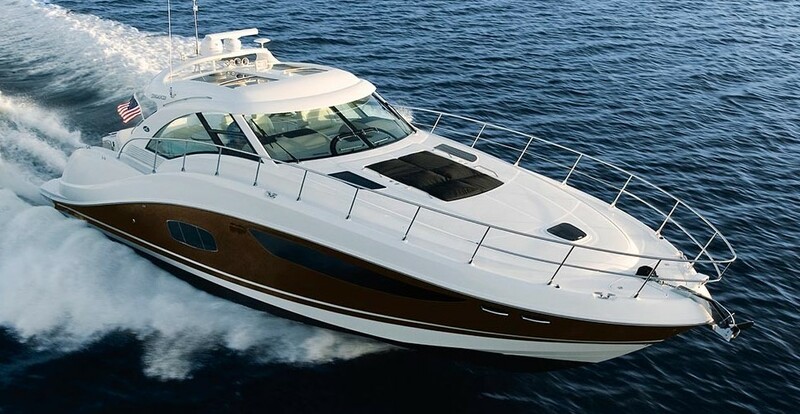 SYS Yacht Sales offers used Sea Ray Yachts for sale worldwide, including Sea Ray Sedan Bridge, Express, Sundancer, Aft Cabin models and more. Don't see the vessel you're looking for here? Contact our experienced yacht brokers for assistance, we look forward to helping you find the yacht that's right for you. Other photos: Photo 1, Photo 2, Photo 3, Photo 4, Photo 5, Photo 6, Photo 7, Photo 8, Photo 9, Photo 10, Photo 11, Photo 12, Photo 13, Photo 14. Beautifully maintained boat with tons of great upgrades in 2018! Most recent two year service on the engines, new bow thruster charger, and new stereo system. Speakers/amp/subwoofer all new! All TVs were upgraded to HD flatscreens and a camera system was installed in the engine room. Perfect for entertaining - swim platform and three large staterooms sleep 10 comfortably. Huge couch and large bench on the bridge for seating all your guests! This boat is in pristine condition and ready for its new owners! SYS Yacht Sales is pleased to assist you in the purchase of this vessel. This boat is centrally listed by Global Marine - 727-498-6477. More than 50 years of industry-leading boat design has resulted in an unparalleled collection of vessels from 17 to 61 feet. Whether your boating lifestyle is world-class water sports or over-the-horizon cruising, there is a Sea Ray Sport Boat, Sport Cruiser, Sport Yacht or Yacht to fit your needs and exceed your expectations. Buying a Sea Ray: We offer used Sea Ray Yachts for sale worldwide, including Sea Ray Sedan Bridge, Sea Ray Express, Sea Ray Sundancer, Sea Ray Aft Cabin models and more! Contact our sales professionals for immediate assistance. Selling Your Sea Ray: With a team of experienced yacht brokers and marketing professionals, we will employ a comprehensive marketing approach to ensure your vessel receives maximum global exposure online as well as exposure in person at major boat shows. Learn more about how SYS Yacht Sales will help to sell your Sea Ray yacht! Call 941-365-9095 and start your search today! We look forward to helping you find the yacht that is right for you.